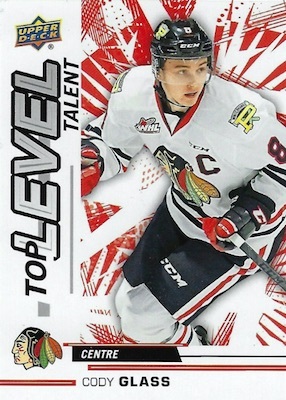 Focusing on key talent from Canada's major junior hockey leagues, 2018-19 Upper Deck CHL Hockey offers the second year of UD's Canadian Hockey League trading card exclusive. The set keeps to the basic formula on display in 2017-18, but the '18-19 format shifts to 18 packs per box and 12 boxes per case. The '17-18 release had 16 packs per box and 20 boxes per case with two inners. Since the pack size remains the same at 12 cards, the overall box yield increases by 24 cards. Similar to a minor league set, the lineup once again features standouts from the Ontario Hockey League (OHL), Quebec Major Junior Hockey League (QMJHL/LHJMQ) and Western Hockey League (WHL). 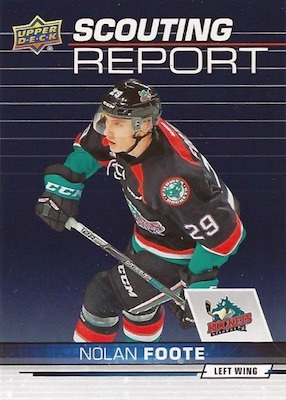 In total, the 2018-19 Upper Deck CHL Hockey checklist contains 400 cards in the base set, with the final 100 being Star Rookie short prints. These SP cards average one per pack. Parallels include Exclusives (#/100) and High Gloss (#/10) versions for the Star Rookie subjects, plus Printing Plates (1/1) for the entire base set. There are also base and Star Rookie Autograph versions that average 1:8 packs. Each Hobby box should have one signed card. 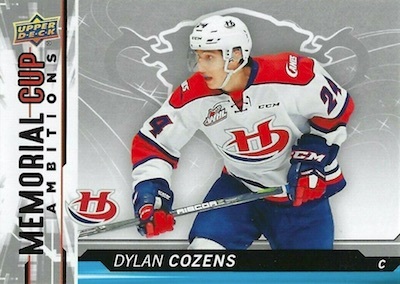 Falling about six per box, or roughly 1:3 packs overall, the 2018-19 Upper Deck CHL Hockey insert lineup offers the all-new Memorial Cup Ambitions (1:6 packs), Scouting Report (1:3 packs), and Top Level Talent (1:3 packs) cards. SP Top Prospect insert cards are a case hit at 1:120 packs. 400 cards, including 100 Star Rookies (1 per pack). PARALLEL CARDS: Printing Plates 1/1. STAR ROOKIES PARALLELS: Exclusives #/100, High Gloss #/10. 109 cards. 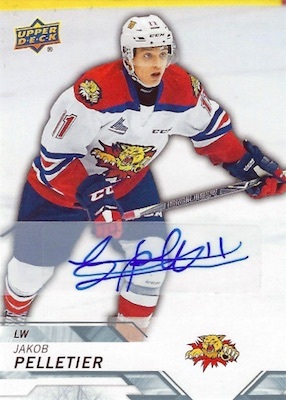 Buy 2018-19 CHL autographs on eBay. Overall odds - 1:8 packs. Specific group pack odds noted below. View the 2018-19 Upper Deck CHL Hockey checklist Excel spreadsheet. What’s the hold up? They keep pushing the date back. Grabbed 2 boxes. One had an auto, SP Top Prospects case hit and a UD Exclusive Star rookie. Other has 2 autos and a printing plate. Plus tons of solid inserts all around. 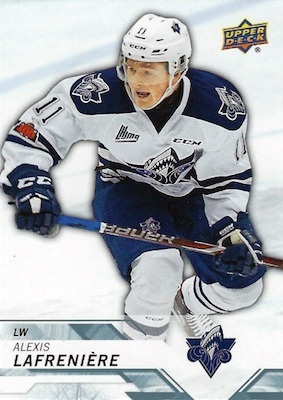 Worth picking up for a CHL fan like myself all day.